View More In Screwdriver Sets. 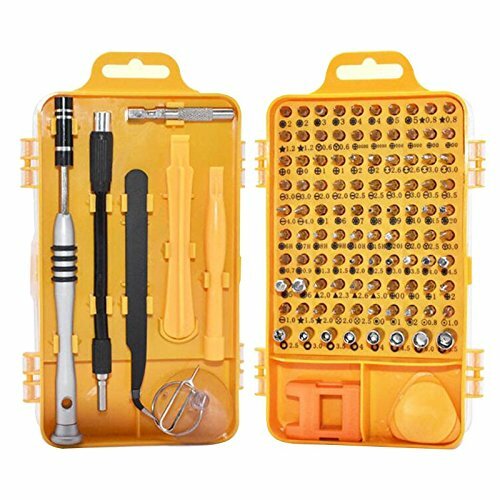 Professional 110-in-1 multi-function interchangeable precise manual tool set, including a tweezer, a handle which is magnetic, an extension bar and 42 screwdriver bits. Light weight and compact design. It is easy to carry and store at home and work. Screw driver with STRONG magnetic tips and anti-slip. Precise design, high quality, compact material, static-free handle; Portable and fits in pocket- Great for home, business, travel or shop. ❥PREMIUM QUALITY-Made of high quality Chrome vanadium alloy steel, ensure durability and longevity. ❥ERGONOMIC DESIGN-Special ergonomic design with workmanship craft, soft touch screwdriver for the most comfortable experience. ❥EASY TO USE-Precisely machined bit tips guarantee accurate size and chamfered bit ends insert into fasteners more smoothly. ❥PORTABLE- Portable and fits in pocket, great for home, business, travel or shop, easy to carry and storage at home or car. ❥COMPLETE SET-Professional 110-in-1 multi-function interchangeable precise manual tool set, including a tweezer, a handle which is magnetic, an extension bar and 42 screwdriver bits.